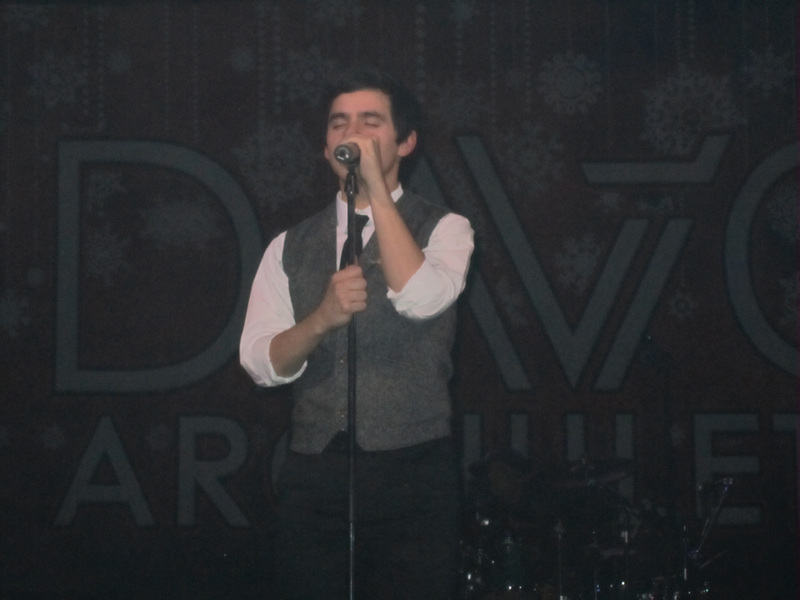 It was a Saturday morning, the day of David’s My Kind of Christmas concert at the Turning Stone Resort in Verona, New York. A day I had planned months in advance. I had woken up earlier than I thought I would – despite much needed rest from a rather hectic, drama-filled, attitude-getting, temper-losing event the day before. It wasn’t until I hit I-90 and started playing my “Anticipating David” playlist (hee) that a peace and calm washed over me. On my mixtape, I started with his “Joy to the World,” followed by “What Child is This” and “O Holy Night,” and found myself weeping uncontrollably. The cleansing was about to begin. After giving thanks to the blessing that is David Archuleta, great weather in the northeast for the month of December, a straightforward journey on the road, and a relatively easy search (as it turns out) for folks I’ve never met offline, I had an early dinner with Burkey, Burkey’s daughter, Marlie, Freo, and luv4DJA. Good times to be had, as we immediately chatted and dined as if we’d known each other all along (and, well, we DO, even if only as David Fans and Soul Davidians). We then made our way (in circles at first since the rather gaudy, gliterry resort casino at Turning Stone didn’t make it easy to figure out how we were to find the VIP line or even where the show was to be held. Before I knew it, after collecting my poster and memorabilia, I entered with the others into a room, saw the keyboard in front (started getting excited that we’d get a special mini-concert), and wondered how best I could see him in the crowd. Eventually, I followed Silver Fox, Sandy Beaches, and luv4DJA, who were “experts” in Meet and Greet. The best strategy, they said, was to sit on the sidelines, watch David from afar, and then enter the meet-and-greet line toward the end since we would get more “quality time” with David. heh. So, you could say I had some quality time with David. I gave you the verbatim of what I said to David and what he said to me back, but I don’t think I described what I saw or what I sensed. First, his eyes didn’t catch the florescent lighting in the room, so they didn’t sparkle the way they did the first time I saw him live at northern lights. He was also squinting, so I didn’t get the full on sparkle so many of you described. Not that this spoiled anything for me, because his eyes still meet you full on regardless, and he had that way of looking at you – not like he’s trying to sum you up or dress you down – but like someone who’s really interested in YOU, the person, the soul, not just accepting you at face value. As such, David came off as an Innocent. And I don’t mean that “innocent” as in he knows nothing, has no knowledge of the world or the way of human nature and all that. I mean, he’s a deliberate Innocent. He’s somebody who’s working hard at keeping his thoughts and actions and words and heart and soul pure and righteous. It’s because I sensed that in him why I thought to keep the origin of my “Hello, Gorgeous” greeting to myself. I had a feeling he would get all bashful and shy, and part of me didn’t want to put him on the spot – he started blushing just a tad, so I nicely put away my coy feline-like playful side and decided, instead, to be the gushing fangirl who just wanted a hug. His “Sure!” response to my request was indication to me that he was right back in that comfort spot – where he was willing to generously give of himself. Sometime in the posing of our picture-taking together, I managed to mumble something about how I’ve been blogging about him for two years and how amazing it was to stand next to him because he has become more real to me. I think he said something like “Really?” Hmmm, what did he say exactly? It’s amazing how some memories of that first-time meeting are so crystal clear while others are so murkey. I think it was Rascal who said of his first one-on-one meeting with David that he reminded him of a “fawn in a forest” (or something of the sort), where he has this kind of willingness to be open while the openness is also tinged with some self-protected withholding of himself. I totally got this impression too. It was also fascinating to watch him from afar, which is what I did while waiting for the meet-and-greet line to thin out, and all I could think of is how recognizable he had become to me: every mannerism, every gesture, every dimple, even the different kinds of smiles and laughter he exhibits, the way he holds his hands, the way he stands, the way his hair was styled, I had come to know them quite intimately. So, how uncanny it was for me to meet an indvidual for the first time and still feel like you’ve known that person all your life. But what can I say? It’s an experience to treasure, needless to say. After the photo-op meet-and-greet, David then skipped over to the keyboards and first offered an a capella rendition of “Happy Birthday” to all the December folks in the house, and then made requests for 1) songs and 2) whether he should sing with the keyboard or in a capella. I naturally yelled out for him to sing a capella (but no, I guess the keyboards were there for a reason, and after all the different song choices suggested, he went with his own – heh, he’s so subtle in getting his own way while making it seem like we all consented!). So, he performed a medley of A Good Place and Let It Be, which of course his Vocals were on point, but man, why didn’t he take my suggestion to sing a capella? As someone said while I was live-blogging yesterday, these keyboard mistakes are becoming something of a signature (which of course so many fans find cute, and which I find rather annoying – I know he can do better and wish he would hold his keyboard skills on the same perfectionist level he holds for his vocals). Isn’t it curious that no one ever describes the feel and the scent of him when you get that close? I’m trying to recall the senses, and I’m drawing a blank on those details, hmmm. Now on to THE SHOW!!!! David’s My Kind of Christmas Show is definitely THE SHOW to go to this season. And it was so much fun since we were seated at tables and so close to the stage. Venue is everything – no mosh pit here, just kicking it and chilling with my online friends-turned-offline friends. I sat right next to Marlie, and we kept leaning into each other every time David hit a money note (what are friends for, right?). Burkey, Freo, Silver Fox, and Sandy Beaches were all seated nearby, me sipping my wine while others had their own choice of drink. Oh, and if I hadn’t already said it in the past two years I’ve been blogging on Soul David, then I need to say it again (and on a loop). 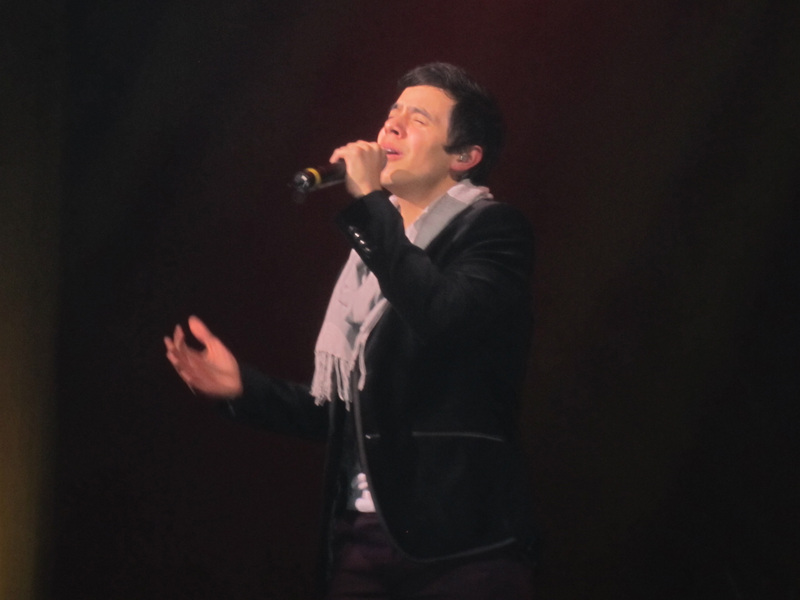 David Archuleta is the finest, the greatest Voice of his generation. He is miles, no, he’s light years ahead of the rest when it comes to his musical gifts and his vocal brilliance. It was like witnessing his “Don’t Let the Sun Go Down on Me” finale performance to the nth degree. To say that David was on fire last night is to make a serious understatement. It was like he was channeling all of the sun’s fiery surface and setting the world ablaze. Yeah, I’m prone to hyperbole, but trust me when I tell y’all that videos are a poor substitute for the experience of David Live. The Voice fills you up completely, lifts you up, and transports you to another plane. Nobody else among his peers has that power, has that passion, has that intensity. David is as Real Deal as we’re ever going to see, and when I say I cannot wait until he’s 25 (physical, sexual, musical peaks and all that), I mean, I cannot wait until he turns the music world (and the rest of the world for that matter) upside down. Because the truth of the matter is: David has that gift and he has that ability. We will set aside for the moment that the music industry is in a suckhole and his present management may not be in the best position to build David a bigger platform worthy of his talents, but something tells me that in the next 4 or 5 years or so, if he keeps doing what he’s doing, developing his craft (which is what every young’un his age SHOULD be doing anyway), honing his skills, and blowing us away every step of the way, he won’t be contained. Yeah, I’ve got what you call a fan’s biased FAITH in his eventual world takeover (I don’t have 31 David Dreams for nothing now), but I still believe. Did you hear him perform “Climb Ev’ry Mountain” like he meant it (see my above video) and made sure we all felt it? That performance was dedicated to the children of the Child Fund, which as we all know, combines David’s interests in children’s welfare and in giving back to the world. Something tells me David is in a very “good place,” and he’d give up all kinds of red carpet events and platinum sales for this kind of work in a nanosecond. He knows what his priorities are. Speaking of which, did I tell you that this show was all kinds of “My Kind of Perfect”? 🙂 From mixing in the Christmas carols (“This Christmas” in particular had me giddy because Soul David was just showing out on that song! 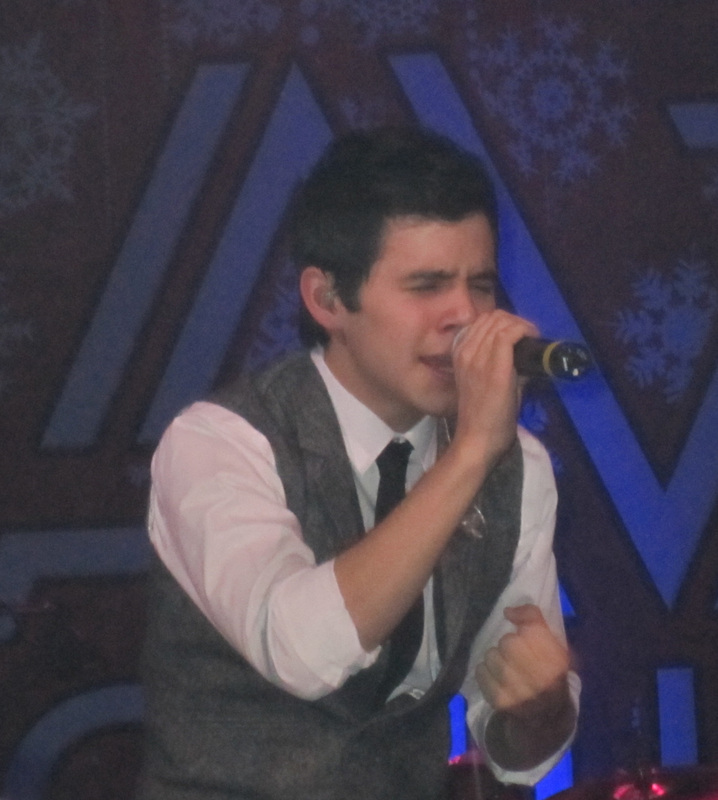 Sorry my video didn’t come out for that one) to performing some of his own originals, like “Wait,” “The Other Side of Down” (his choreographed moves are getting better most definitely), “Crush,” and “Zero Gravity.” He also looked so much like the Man (and less like the Boy) in his vest and tie. 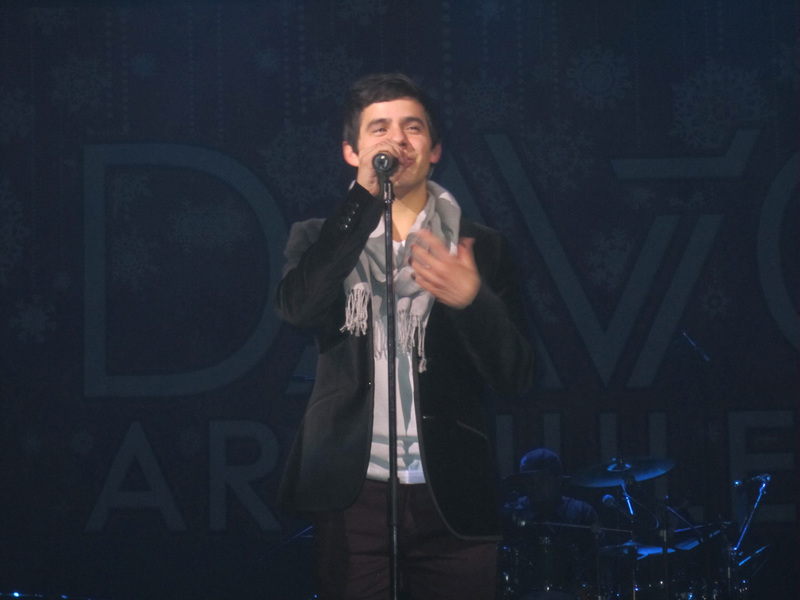 And then he actually came out after the intermission in a stylish black jacket, THE SCARF!!! and some reddish brown pants (outlining his slight form). He just took over that stage and commanded his band AND his audience like a genuine superstar. I was still marveling at how this rather timid, innocent-seeming guy who I met at the Meet-and-Greet transformed into this handsome Man on Stage, as small as Prince but just as grand in his musical delivery. 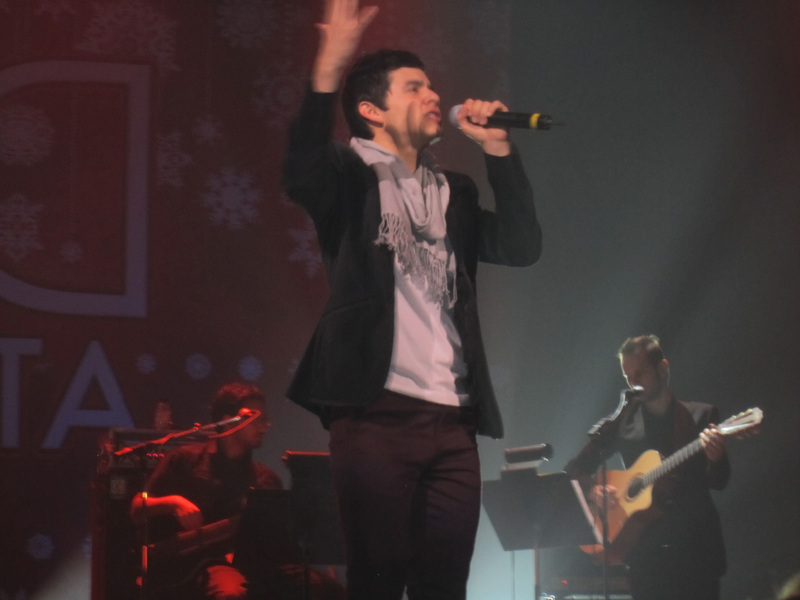 He was just so magical, from the hushed tones and crescendoes in his somber take on “Ave Maria” to his very Latinesque take on “Fa La La La La” (yeah, I saw some salsa moves up in there – go, David!) to the soothing balm of his velvety smooth-like-butter Voice on “Silent Night,” which was magically enhance with some falling snow that flurried over us. I still get goosebumps over the whole effect of it. “The Little Drummer Boy.” Nuff said. Can I get a witness? Notice how these lyrics come after that powerful money note that entered straight into my heart like a fire-torched arrow as he raised his drumsticks triumphantly in the air: ME AND MY DRUUUUUUUUM!!!! Preach it, David! I feel you! And yes, He IS smiling at you, as we all are. So, this Mission talk? Let’s stop speculating. David is already on his mission! Anyone who heard his rendition of “The Little Drummer Boy” LIVE knows what I’m talking about. By the way, I’m searching all over the Internet for a good audio mp3 rendition because I need to play this on my ipod on a regular basis (I wish this were on his Christmas from the Heart CD). Trust me when I tell you that none of the videos do the song justice in the way David delivered it (which is why I’m not even bothering to upload mine). Well this post is already lengthy, but I had so much to process and reflect on and meditate on, and part of not only seeing David in the Flesh (“And the Voice became Flesh and was made Man performing live on stage”) is the joy and fun in matching real faces to the screen names in the fan base. We really are a close-knit community, and we really do have David’s back. Oh, and did I tell you I’ve learned I actually have fans of my own? Somebody asked me to take a picture with them as a “fan of my blog.” Who knew? Good times to be had! And I am most definitely WELL in my soul and in my mind and body, with a dose of DAVID LIVE!!! I hope those of you who are still on the fence about going should definitely do the show if and when you can. The VIP tickets are worth every penny and more! Looking forward to tuning in to the other shows, but nothing will ever match the magic and the passion of David’s My Kind of Christmas in Verona.